A seven month old baby demonstrates the hands and knees crawling position. The knees must bend to place the knee joints under the hip joints. This is one of the most common questions asked by moms in classes and through my website. Baby seems to resist putting her knees on the floor when mom tries to put her in the hands and knees crawling position. This mom is not alone with her question! It is wonderful that this mother would like to learn some parenting tips for teaching baby to crawl. Simple activities at home on a daily basis are both a fun form of baby play and beneficial for baby motor skill development. Let’s take a look at three developmental activities for baby. One of the ways that babies get into the hands and knees crawling positon is by lifting their pelvis up and bending their knees to bring them under their hip joints. The plank positon (or push-up position) is a straightening of the legs by stiffening the knees. This is the opposite action of what baby needs to do with her knees. Before baby can learn to bend her knees and ultimately put them on the floor beneath her hip joints, she must have a clear feeling of the knee joint itself. Gentle proprioceptive activities improve the awareness of body parts for baby. We recommend tapping the knee while saying “This is your knee,” and gently squeezing the knee and holding the squeeze for a moment while repeating “this is your knee.” Observe baby and see if she is paying attention to what you are doing. She will become quiet and feel what you are doing. This is how to improve baby’s awareness of the knee joint for the motor skill development of crawling. Once baby has an improved awareness of her knee joint, you can improve her awareness of the knee joint action which is bending and extending. After the tapping and squeezing recommended in crawling tip #1, put her on her back. continue tapping and squeezing the entire leg while saying, “This is your leg.” Repeat with the other leg. Then hold one leg and gently bend it in toward her chest and slowly extend it toward the straight position. Do not force this movement. If her leg does not move easily, baby’s muscles are stiff. Focus on just the tapping and squeezing for a few days and that will help the muscles to relax. The bending and extending of the legs shows baby that she can both bend and extend the leg. Soon she will soon bend her leg more frequently on her own. Baby play time can include a fun game of playing a box like a drum. Place a cardboard box upside down with baby on knees in front of it. Gently press her knees down so she feels the pressure of putting the knees on the floor, which you would like her to learn to do on her own. Play the box like a drum with your own hands, pause, then invite baby to drum. Create a call-and-response type of game where your hit the box “rat-a-tat-tat” and then wait until she hits it “bop-bat-dat.” Go back and forth taking turns. This gives baby an experience of being on her knees. She will feel comfortable in this position and choose it more easily, facilitating the development of the hands and knees crawling position. Oscar, at age 6 months, is preparing to crawl on his hands and knees. Observe how he repeatedly rocks back and forth on his hands and knees in the above video from monkeytoesshoes’ youtube channel. Until now, his hands and knees have not supported much weight in the motor skills of rolling or belly crawling. This action of rocking strengthens babies’ bones in their arms, hands, legs, and knees. It also stretches the muscles in the hand which is an important development of the hand. It is very difficult to crawl with closed fists since the weight does not transfer as well onto the hands. Baby is very good at grasping toys with tightly closed fists which tightens up the muscles of the hands. This action of rocking is also discussed by developmental experts as an important development for holding pencils in school. After several days of this preparation, Oscar will have his mother chasing him around the house as he crawls to explore the world around him. One of the essential baby milestones that occurs prior to the major milestone of crawling is the ability to shift weight. In skilled athletes, such as professional dancers, this is an essential skill that separates beginners from the advanced. If you observe a beginning ballet student in class they have difficulty moving forward in space from one move to the next where the professional connects every move with ease and fluidity. This skill occurs in the muscles, bones, and nervous system in such a minute way it is difficult to see and understand what is happening. Often, parents do not understand why this skill of rocking on the hands and knees is such an important preparation for crawling. Moving forward in space, for both baby and a dancer, requires transferring the support and balance from one part of the body to another. The motor milestone of crawling may be achieved through a few patterns of movement. Some babies learn belly crawling with their stomach on the floor, others learn hands and knees crawling, and a few learn hands and feet crawling which is known as “bear crawling.” Some babies learn to crawl with a homolateral coordination where the arm and leg on the same side go forward at about the same time. Many babies learn to crawl with the contralateral coordination where the opposite arm and leg move forward at about the same time. For baby, the most important accomplishment achieved with the milestone of crawling is that she get to stuff much faster! Baby sometimes learns to locomote across the floor by moving on her hands and feet only, without letting her knees touch the floor. This is commonly referred to as “bear crawling.” Some babies learn to crawl in this pattern and use it as their primary means of locomotion. Others learn to crawl in a different pattern such as on the hands and knees and occasionally use the bear crawl pattern. This appears to be the case of the baby in the above video from poarg1021′s youtube channel. While playing outside, the baby crawls in the pattern of the bear. After awhile he stands up and takes a few steps. When he approaches the door to go inside the house he switches back to the hands and knees crawling pattern. 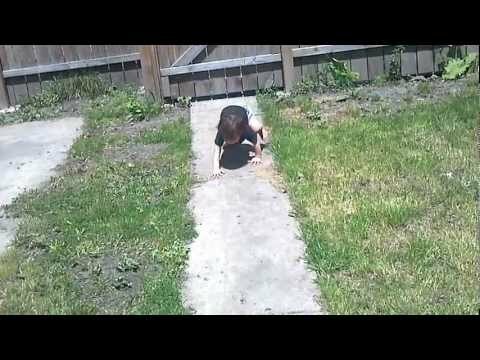 In this video you can clearly see the difference between the crawling patterns of the hands and feet (like a bear) and the hands and knees. WHY DOES BABY CRAWL LIKE A BEAR? Parents ask, “Why does my baby crawl like a bear?” There are a few possible reasons. Baby crawls like a bear to protect the knees because he is wearing clothing such as a shorts and the knees are exposed, or because he has learned to walk and it is a crawling pattern that is closer to walking (it is not as far down to the ground as the hands and knees pattern), or he was put on his feet a lot as a baby and his brain learned to put the feet down on the floor rather than the knees. Or, maybe this pattern is just funny and interesting to him. What is more important to ask is what else can baby do when he moves? Can he also crawl on his hands and knees like the baby in the video above? Or, is this his only pattern of movement? The baby in the above video moves with skill since he transitions easily from bear crawling to walking to hands and knees crawling. Advertised as a protection for bruises, scrapes, and cuts, baby knee pads are one item you can leave off of your baby gear list. They are constructed as a stretchy sleeve with a firm cotton or silicone piece that slides over baby’s knee joint. When baby crawls, the pad goes down on the floor with baby’s knee and “protects” it from the hard surface. An important question to ask is how do these knee pads effect baby’s development of the motor milestone of crawling? Let’s evaluate knee pads by looking at three developmental tips that help baby learn to crawl. Crawling occurs on the hands and knees when it is in its most efficient pattern. Some babies learn to crawl on the hands and feet (bear crawl), but most babies learn to crawl on their hands and knees. Developing a very clear feeling of the bones and muscles of her knee joints, which is called proprioception, baby feels more stable as they touch the ground and support her weight. With the knee pads the soft protective material in front of the knee may make it difficult to feel the physical sensation of the bones of the knees clearly pressing into the floor. It might be similar to an adult standing on a thick cushioned exercise mat rather than on a hardwood floor. The adult would feel more stable on the solid floor as well. Some babies feel distracted by the strange sensation around their knee and try to crawl while avoiding putting their knees down, in the bear crawl pattern. Instead of buying knee pads, try tapping and gently squeezing her knee joint so she will feel it more clearly and remember that the firmness of the floor is helpful. She will feel more stable and balanced. Wearing a simple cotton pair of pants can also prevent scrapes. Remember that babies learn to crawl without knee pads on stone floors all over the world in countries such as Mexico and Israel. To get into the hands and knees crawling positon, baby has to bend her knees, this is called “flexion.” Both the knees and the hips bend until the hands and knees are on the floor. Once baby begins to crawl, each “step” she takes requires bending the knee quite a bit. The knee pads may limit the bend in the knee joint. Although they are made of a flexible and sometimes thin material, it sits right in back of the joint and may diminish the range of motion to some extent. Full range of motion is essential for baby to achieve the optimal alignment for her skill development. I have seen videos of babies wearing knee pads where the pad rides up or twists around, limiting the flexion of the knees. Instead of wearing knee pads, try bending and extending her legs while she is lying on her back to remind her to bend her knee. When the knees bend easily and she feels her knees firmly on the floor, baby easily achieves her proper alignment for crawling. The shoulders are placed more or less over the hands and the hips are placed over the knees. Wearing baby knees pads may lead to her knees sliding around a bit inside the pad or minimize the bend of her knee making good alignment difficult. Opt to leave the baby knee pads out of the gear bag. Benefits of proper alignment include more strength or power in the motor milestone of crawling. If the knees are not quite under the hips baby may not get as strong of a push off of the floor. Starting from good alignment will also prepare her for standing and walking. Her body is learning to place her knees under her hips which is the same alignment for standing and walking. Initially, babies often walk with the feet a bit wide and then as their balance improves they bring their feet and knees more underneath their hips. If they are familiar with this hips-over-knees alignment when crawling, they will find it more easily in the motor skill of walking. There are many ways that babies can learn to sit. Remember our post Baby Sitting Up? It discussed the importance of baby learning to get in and out of the sitting positon on her own. 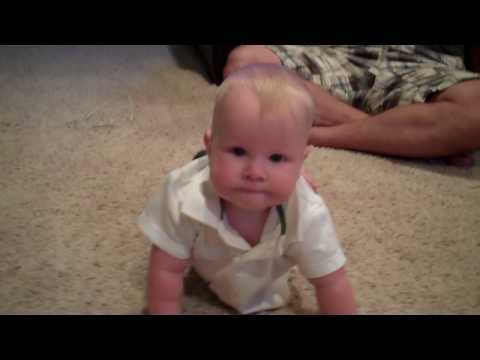 In the above video from nvyork’s youtube channel, baby Tris demonstrates one of the ways to sit from the crawling positon. From either the 4-point or the belly crawling position, Tris brings his left knee forward and then pushes backward with his hands to sit down on his bottom. Watch how easily he gets in and out of the sitting position. This is wonderful motor skill development! He is much more independent when he can decide for himself when to sit and when he would like to go somewhere else in the room to play. MOTOR DEVELOPMENT: BABY STANDING TOO EARLY? During his lesson, the eleven month old baby grabbed his grandmother’s trouser pants and proudly pulled himself up to a standing position. The grandmother was very tempted to congratulate him, but she knew better. She was wise enough to take his hands back down to the floor. “Not yet,” she quietly said, “Wow! That is good crawling.” She praised the motor skill activities appropriate for the moment. Parents are eager to see the day that baby grabs onto their leg to pull himself up to a standing positon. This means the day he will walk independently is soon approaching. There is no question that the motor skill of standing up is one of the most celebrated baby milestones. It signals the end of infancy is approaching–the transition from moving on all fours to standing and walking on two feet. IS BABY STANDING TOO EARLY? Sometimes baby learns to pull up to a standing position too soon, before his bones and muscles are strong enough to support him. In this situation, it is best for the parent to take his hands back down to the floor and tell him it is not time to stand, and it is still time to crawl. It is very beneficial for baby to crawl for several weeks before standing up. For many years, experts in the field of child neurology and development have researched and shown that crawling is very important for the development of the brain. Give baby plenty of time for crawling. The baby milestone of crawling strengthens his bones and muscles, improves his coordination, and develops his brain. Baby is imitating an older sibling. Baby attends daycare where older babies are standing and walking. Baby spent time in equipment such as a jumper that put him on his feet too soon. Remember, babies learn by imitation. They are motivated to do what everyone else around them is doing. If baby is around an older sibling or older children at daycare, often he will try and stand too soon. With parental encouragement to continue crawling or to learn to crawl, baby will understand that crawling is the better choice. Through offering a lot of praise when they crawl, baby will understand this is the preferred milestone for now.